Introducing the brand new NiteSafe Duo by Xtralite. The Duo is a highly useful emergency torch and nightlight that is always charged and ready for use. 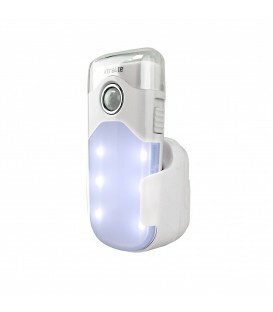 The 4 LED torch sits in a charging cradle plugged into the wall and is kept permanently charged by induction charging. If the power fails, or you take the torch from its charging cradle it switches on automatically. The Duo has two nightlight options. Dusk to Dawn, where the nightlight will turn on when the area gets dark and turn off again when it gets light and Motion Sensor, with this setting chosen the nightlight will turn on as soon as movement is detected in a dark area. With a great modern design and light feel the Duo will fit in anywhere you place it. To find out more info click here.